Column critical maximum buckling force calculator - formula & step by step calculation to find the maximum allowable buckling force of a vertical column or rod. F = (π2 x E X I)/(K x L)2. Young's modulus (elasticity) of the column material E in Pa, area moment of inertia of cross section of the column I in m4, unsupported length of column L in m & column effective length factor K are the key terms of this calculation. 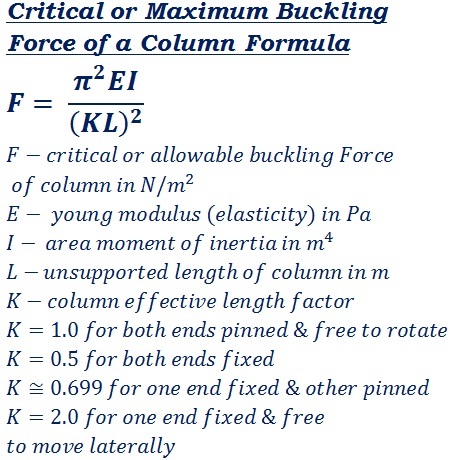 The below mathematical formula is used to calculate the maximum allowable buckling force of the column in mechanical engineering. Besides, the step by step calculation for each calculation performed by using this calculator let the users to know how to perform critical buckling force calculation. In the field of mechanical engineering, sometimes, it's important to analyse column buckling force. The above formula & step by step calculation may be useful for users to understand how the values are being used in the formula to find the column maximum buckling force, however, when it comes to online for quick calculations, this calculator helps the user to perform & verify such mechanical engineering calculations as quick as possible.